Piana degli Albanesi Church is distinguished by the greek-Byzantine rite. In liturgical celebrations are used both the Greek language that the Albanian language. The religious ceremony is solemn and rich in symbolism. Religious events are held throughout the year, but reach their climax in the celebration of Holy Week. We think that you can miss it at all, so if you are in Sicily in Easter time you have to go to visit Piana degli Albanesi, and if you don’t have yet reserved an accommodation, you can look the catalogue of Villas in Palermo very near to Piana. Easter celebrations in Piana degli Albanesi are very striking. There is a strong link with the ancient belonging to the Albanian ethnicity and tradition, perpetuated in the life of every day, in religious rituals and language. Here, since more than 500 years ethnic peculiarities, linguistic, cultural and religious origin are preserved jealously. 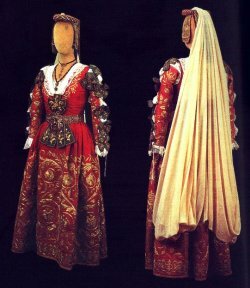 Piana degli Albanesi inhabitants, thanks to their tenacity and their own cultural and religious institutions, over the centuries maintained unchanged their identity and their cultural roots such as the customs, traditions, the characteristic richly embroidered women’s costumes, Albanian language and Byzantine Rite. Easter red eggs are a tradition in Piana going on for centuries. They are full of symbols that recall the life, fertility and resurrection; red eggs, prepared for the Easter Saturday, are eaten after noon, when the bells return to playing and the smell of incense fills the houses. They are also used to adorn the Easter Breads, and are distributed to the devotees and tourists on Easter Sunday, after the parade of women in traditional Albanian costumes and the blessing . It is an Eastern tradition of Greek-Byzantine rite and all the families of Piana prepare red eggs to celebrate Easter.